Turalar are nomads of plains and steppe; following their herds and raiding other nomads or settlements. Skilled horse riders and archers, their mobility makes them unpredictable foes and their savagery is both boundless and renowned. Turalar horses are small, yet fierce - treat them as riding horses with warhorse programming; they do not flee danger, will kick but cannot trample. Reavers and ravagers ride captured warhorses and lack any such constraint. Of any Turalar force, 40% will be these lightly-armoured nomads. They often ride in groups of four, patrolling or scouting future opportunities to report to their leaders. They rely on speed to outrun sizable opposition but return with other Turalar to prove a point. The riders are opportunistic and will take what is weakly guarded unless told not to by the leader. This is accepted practice among the Turalar and tactically has led them into fights that they have later come to regret - yet they are unwilling to learn from experience on this. Of any Turalar force, 30% will be raiders. These have seen some success with previous raids and managed to find some armour as well as other ill-gotten booty; as a result they are more inclined to fight for any prize that becomes apparent. 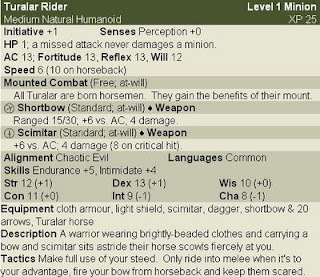 Like all Turalar, the raider is a superlative horserider who prefers to ride the hardy and fierce Turalar horse. The raiders are renowned for moving swiftly during battle and keeping enemies on their toes, specialising in the wolfpack tactics of their neighbour. 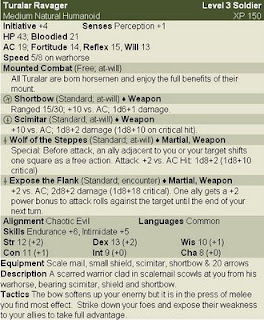 The raiders refer to themselves as 'wolf-brother' to the alarm of enemy spies who suspect werewolves hide among the Turalar, something occasionally used by the Turalar as a weapon of terror against superstitious cowards and used with some irony by werewolves who live near Turalar lands. Of any Turalar force, 20% will be these seasoned warriors; experienced raiders who have traded for scalemail and for a warhorse. 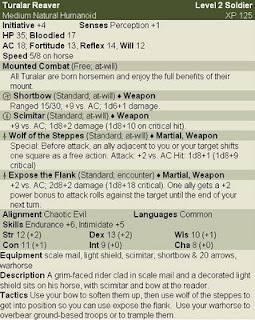 This opens up new realms of pain for enemies as reavers are completely happy about trampling foes or using their warhorse to overbear weaker opponents. The reavers are especially fierce for their skill in opening up weak points in a foe's defence. 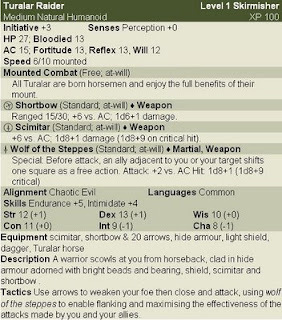 Combined with the wolf of the steppes maneouver, this can cause havoc around an enemy formation - something which a reaver knows and will capitalise upon. The reaver is known as a 'dragon-brother' among Turalar warriors because of his scalemail. Spies are less inclined to believe the Turalar on this matter. Yet the reaver can evoke similar fear when backed up by other Turalar and this warband can rival a dragon in settlement destruction. The leaders of any Turalar force, they make up 10% of the group. Their authority however is continually in flux due to the nature of the Turalar and often only have an authority within their sight. That said, the mobile nature of the Turalar ravager gives them quite a lot to see. Like the reaver, the ravager is skilled in horseriding and will capitalise on the superior armour and warhorse that they possess. They often practice atrocious rites where they massacre innocents by running them down, cutting them up and then throwing the pieces into a fire. The ravager is not particularly keen on points of etiquette preferring appeasement or bloody-handed murder to any kind of negotiation. Captives of the Turalar find death is not the worst fate yet, the slow death that a ravager will inflict in their rites is exceedingly unpleasant.